Warm a large skillet over medium heat. Spray with cooking spray and add the Brussels sprouts. Season liberally with salt and pepper. Cook, stirring frequently, for about 10 minutes, until the sprouts are softened and most are browned. Remove from heat, transfer sprouts into a large bowl. Set aside. Heat a small skillet over medium heat. Spray with cooking oil. Add the minced garlic and cook, stirring occasionally, for 1-2 minutes, until just softened and fragrant. Don’t let it brown, or the garlic will become bitter. Immediately remove from heat and spoon garlic into a small bowl. Add olive oil and lemon juice. Whisk together until emulsified. 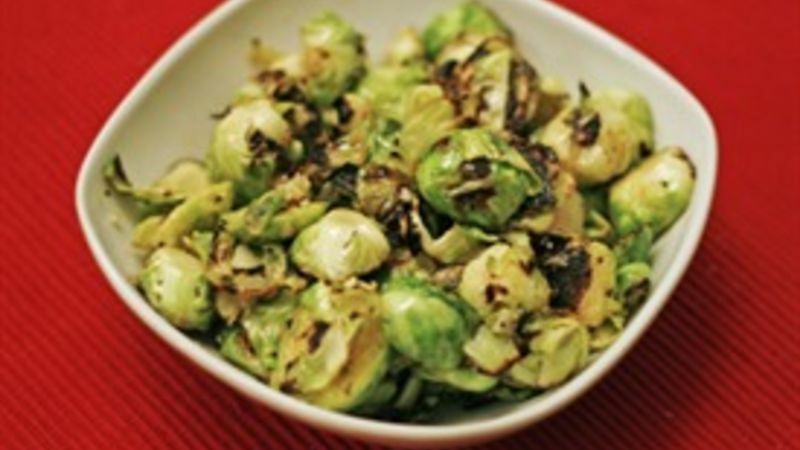 Pour the vinaigrette over the Brussels sprouts and toss to coat. Taste and add more salt and pepper as necessary to achieve desired seasoning.